Hinging the club UP can cause big problems for many golfers in search of consistency. 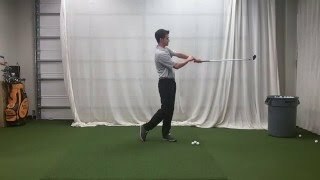 Too much vertical hinge causes the path to be steep and the face to be open and most golfers don't like the consequences of the extra body shallowing moves. In this video, you'll learn to feel what shallow arms really feels like. This is a necessary compliment to a body powereddownswing. Across The Line or Laid-Off Understand how varying backswing positions can impact the downswing.